This personal website does not reflect the views of my employer. Every cell in our body has the same genome, yet different kinds of cells express different parts of it. How does this work? How is cell identity encoded in the genome? I explore this question in the nervous and immune systems — both of which have striking cell diversity — using genomic measurements and computation. As a quantitative biologist, I enjoy solving biomedical puzzles with computation, statistics, and visualization. Using gene expression to explore neural circuit function. Different neurons express different sets of genes, but can this information help us understand how neural circuits work? To explore this question, we turned to the Drosophila visual system, a well-established model for studying the development, genetics, and structure of neural circuits. Together with Aljoscha Nern (Janelia) and Lee Henry (Janelia, now CSHL) we combined genetic tools to access individual cell types, a method to profile their nuclear transcriptomes, and a probabilistic model to interpret these measurements. We found that this information indeed helps illuminate circuit function, ranging from fundamental properties such as the neurotransmitters used at each synapse to higher-level circuit feedback mechanisms. → Gene expression levels measured by TAPIN-seq allow the inference of neurotransmitters produced by visual system neurons (row=cell type, column=gene). Davis & Nern et al. 2018. 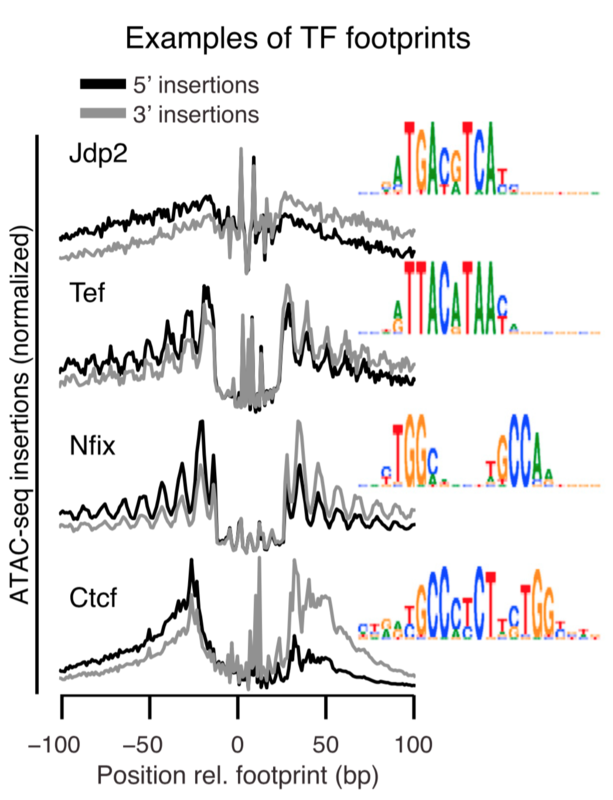 A lineage-determining transcription factor also regulates signal response. T-bet is the master transcription factor that specifies the T helper 1 lineage of T lymphocytes. Using a suite of genomic approaches, we found an additional and unexpected role for T-bet in repressing the Type I Interferon expression program. ← In the absence of T-bet (red), T cells incorrectly respond to interferon-γ (orange) as though it was interferon-β (blue). Mapping the epigenetic and transcriptional landscape of neurons. Together with Lee Henry (Janelia, now CSHL), we developed a genetic approach to measure genomic properties in individual neuronal cell types. This technology reveals distinct gene expression, histone modification, and chromatin accessibility landscapes. We first demonstrated this technology in the Drosophila brain, using Polycomb-associated histone marks and gene expression to predict TFs critical for cell identity. In collaboration with Alisa Mo (Jeremy Nathans lab, Hopkins), we demonstrated the ability of this approach to profile neuronal cell types in the mouse cortex. 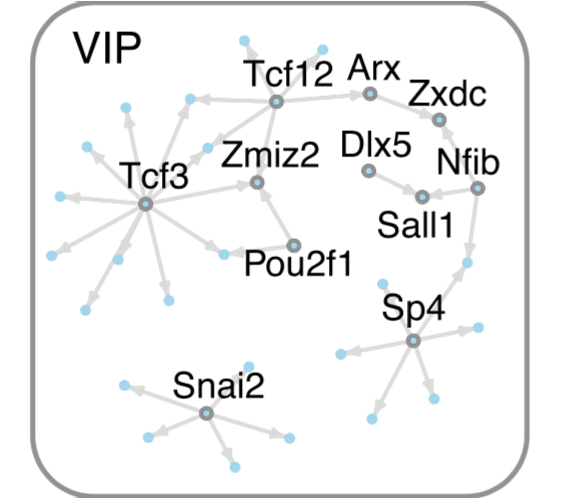 → Cell type-specific genomics identifies footprints of transcription factor (TF) binding and predicts TF regulatory networks active in specific cell types, such as VIP inhibitory neurons. Schwartz DM, Farley TK, Richoz N, Yao C, Shih HY, Petermann F, Zhang Y, Sun HW, Hayes E, Mikami Y, Jiang K, Davis FP, Kanno Y, Milner JD, Siegel R, Laurence A, Meylan F, O'Shea JJ. Immunity. (2019) 50 (1): 106-120. (reprint). Nuclear transcriptomes of the seven neuronal cell types that constitute the Drosophila mushroom bodies. Shih MF*, Davis FP*, Henry GL+, Dubnau J+. G3. (2019) 9 (1): 81-94. (reprint). A genetic, genomic, and computational resource for exploring neural circuit function. Davis FP*, Nern A*, Picard S, Reiser MB, Rubin GM, Eddy SR, Henry GL. under review. Odorant binding protein 69a connects social interaction to modulation of social responsiveness in Drosophila. Bentzur A, Shmueli A, Omesi L, Ryvkin J, Knapp JM, Parnas M, Davis FP, Shohat-Ophir G. PLoS Genetics (2018) 14(4): e1007328. (reprint). A dynamic interplay of enhancer elements regulates Klf4 expression in naïve pluripotency. Xie L, Torigoe SE, Xiao J, Mai DH, Li L, Davis FP, Dong P, Marie-Nelly H, Grimm J, Lavis L, Darzacq X, Cattoglio C, Liu Z, Tjian R. Genes Dev (2017) 31(17):1795-1808. (reprint). Villarino AV*, Sciume G*, Davis FP, Iwata S, Zitti B, Robinson GW, Hennighausen L, Kanno Y, O'Shea JJ. J Exp Med (2017) 214(10:2999-3014. (reprint). The transcription factor T-bet limits amplification of type I IFN transcriptome and circuitry in T helper 1 cells. Iwata S*, Mikami Y*, …, O’Shea JJ+, Davis FP+, Kanno Y+. Immunity (2017) 46(6): p983-991.e4. (reprint). Preview by Lazarevic, Szabo, and Glimcher: T-bet Runs INTERFERence. Afzali B*, Gronholm J*, Vandrocova J*, … Davis FP …, Cooper N+, Laurence ADJ+. Nature Immunology (2017) 18: 813-823. (reprint). Evolved Repression Overcomes Enhancer Robustness. Preger-Ben Noon E, Davis FP, Stern DL. Dev Cell (2016) 39(5): 572-584. (reprint). Developmental acquisition of regulomes underlies innate lymphoid cell functionality. Shih HY*, Sciume G*, Mikami Y*, Guo L, Sun HW, Brooks SR, Urban Jr JF, Davis FP, Kanno Y, O'Shea JJ. Cell (2016) 165 (5): 1120-1133. (reprint). Mo A, Luo C, Davis FP, Mukamel EA, Henry GL, Nery JR, Urich MA, Picard S, Lister R, Eddy SR, Beer MA, Ecker JR, Nathans J. eLife (2016). 5:e11613. (reprint). A metabolic switch for Th17 pathogenicity. Davis FP+, Kanno Y, O'Shea JJ+. Cell (2015). 163:1308-1310 (commentary). (reprint). Selected as Issue Highlight, previewed by Steve Henikoff. NSF Workshop Report: Discovering General Principles of Nervous System Organization by Comparing Brain Maps Across Species. Striedter GF, Belgard TG, Chen C, Davis FP, Finlay BL, Gunturkun O, Hale ME, Harris J, Hecht EE, Hof PR, et al. Brain, Behavior and Evolution (2014). 83: 1-8. doi:10.1159/000360152 (reprint). 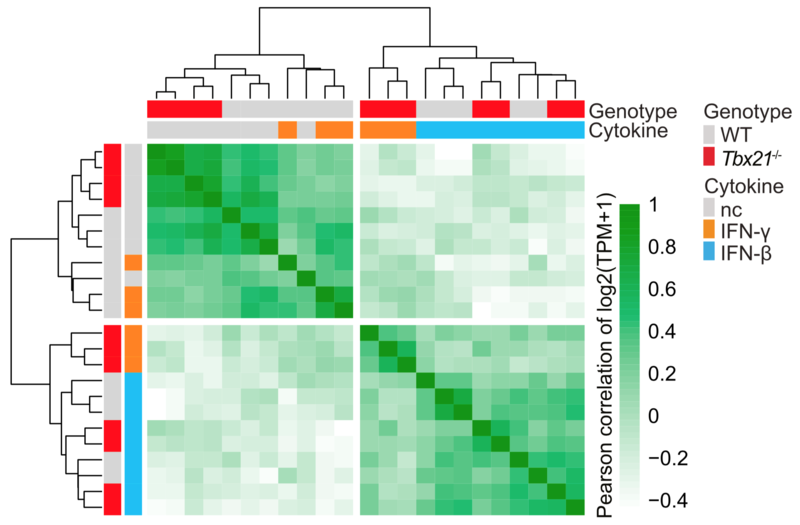 Transcription factors that convert adult cell identity are differentially Polycomb repressed. Davis FP and Eddy SR. PLoS One (2013). 8(5): e63407. doi:10.1371/journal.pone.0063407 (reprint). Cell-type specific genomics of Drosophila neurons. Henry GL, Davis FP, Picard S, Eddy SR. Nucleic Acids Res (2012). 40 (19): 9691-9704. (reprint). Davis FP. Structure (2011). 19(12):1726-1727 (commentary). (reprint). Gene expression analysis in the parvalbumin-immunoreactive PV1 nucleus of the mouse lateral hypothalamus. Girard F, Meszar Z, Marti C, Davis FP, Celio M. Eur. J. Neurosci (2011). 34(12): 1934-1943. (reprint). Proteome-wide prediction of overlapping small molecule and protein binding sites using structure. Davis FP. Molecular Biosystems (2011). 7(2): 545-557. (reprint). Selected for the Virtual Journal of Biological Physics Research. The overlap of small molecule and protein binding sites within families of protein structures. Davis FP and Sali A. PLoS Computational Biology (2010) 6(2): e1000668. (reprint). A tool for identification of genes expressed in patterns of interest using the Allen Brain Atlas. Davis FP and Eddy SR. Bioinformatics (2009) 25(13):1647-54. (reprint). Pieper U, Eswar N, Webb BM, Eramian D, Kelly L, Barkan DT, Carter H, Mankoo P, Karchin R, Marti-Renom MA, Davis FP, Sali A. Nucleic Acids Res (2008). (reprint). Host-pathogen protein interactions predicted by comparative modeling. Davis FP, Barkan DT, Eswar N, McKerrow JH, Sali A. Protein Science (2007) 16: 2585-2596. (reprint) (supplementary text). Marti-Renom MA, Pieper U, Madhusudhan MS, Rossi A, Eswar N, Davis FP, Al-Shahrour F, Dopazo J, and Sali A. Nucleic Acids Research (2007) 35: W393-7. (reprint). Modeling protein interactions by analogy: Application to PSD-95. Protein complex compositions predicted by structural similarity. Davis FP, Braberg H, Shen MY, Pieper U, Madhusudhan MS, Sali A. Nucleic Acids Research (2006) 34:2943-2952. (reprint). MODBASE: a database of annotated comparative protein structure models and associated resources. Pieper U, Eswar N, Davis FP, Braberg H, Madhusudhan MS, Rossi A, Marti-Renom MA, Karchin R, Webb BM, Eramian D, Shen MY, Kelly L, Melo F, Sali A. Nucleic Acids Research (2006) 34: D291-D295. (reprint). Localization of protein-binding sites within families of proteins. The Optimal Size of a Globular Protein Domain: A Simple Sphere-Packing Model. Davis FP and Sali A. Bioinformatics (2005) 21(9): 1901-1907. (reprint). A structural perspective on protein-protein interactions. Pieper U, Eswar N, Braberg H, Madhusudhan MS, Davis FP, Stuart AC, Mirkovic N, Rossi A, Marti-Renom MA, Fiser A, Webb B, Greenblatt D, Huang CC, Ferrin TE, Sali A. Nucleic Acids Res (2004) 32 Database issue: D217-22. (reprint). I've written several programs, mostly for protein structure and gene expression analysis, and all are available at github. I also publish the code I use to make figures in papers, linked above. mdllabbook helps maintain a markdown-format lab notebook. 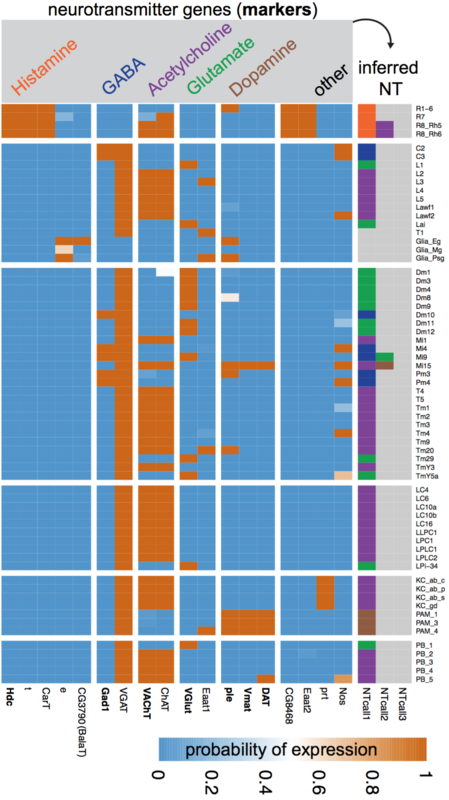 ALLENMINER - A tool to identify genes expressed in patterns of interest using the Allen Brain Atlas. PIBASE - A comprehensive relational database of structurally defined protein interfaces. PIBASE.ligands - Overlapping small molecule and protein binding sites. MODTIE - Software to predict protein complex compositions using structural similarity. Predicted host-pathogen interactions - Host-pathogen protein interactions predicted by comparative modeling. HOMOLOBIND - proteome-wide prediction of protein and ligand binding sites using structure.